First, has anyone replaced the various interior dome lights in their 780 with LED bulbs? If so, where did you source them? Second, in looking at the interior of the passenger side "coat closet", there are mouldings within the walls that suggest it might be possible to install shelves in this space. Has anyone done this? Thanks in advance for any assistance. Ideally for those full-timers that have owned/experienced both, how would you compare the overall build quality of pre-2015 DRV (Mobile/Elite Suites) versus New Horizons? NH's reputation seems to be very close to the gold standard when it comes to "built like a tank", but DRVs were the most prevalent brand at the Kansas rally we attended, so it seems they make a good product as well. I'm leaving Spacecraft out of the discussion at this point as they seem to be on another level altogether (with prices to match). The DW and I can finally see the light at the end of the tunnel. We are putting our house in MD up for sale in the spring and beginning the fulltime lifestyle soon after. These forums have already provided an incredible resource for information, but we are hoping to begin both an online and offline dialog with a veteran FT couple who are willing to mentor us through this exciting, yet anxiety-ridden chapter. We attended the Kansas rally in 2017, so we know just enough to be dangerous. Our focus right now is getting on the road, not so much being on the road. The logistics of this transition are beyond daunting and being able to learn from those that have been where we are would be a tremendous resource. The mrs is a retired US Navy officer, so those in the military family would be especially helpful. Our current plan is to establish residency in SD, but we're willing to entertain other states. We will be in the Tricare health system. 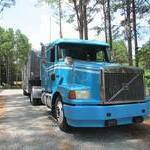 We recently purchased a Volvo 780 with a hauler bed and will likely purchase the fiver/smart after our house sells. We hope to pay this gesture forward in the years ahead after we get our feet underneath us, but for now, we are information sponges and want to soak up all the wisdom we can find. Much thanks in advance for those willing to lend a hand. Interested in pics. mdman26@gmail.com Thanks. Is the unit currently in New Jersey? Two or three pedal auto transmission? Some very well thought out and valid points. Thanks to everyone for their input. As the tiny house movement seems to be accelerating at breakneck speed, has anyone considered one as a full-time alternative to a fiver? The build quality has the potential to be sticks and bricks-grade and a possible quasi-second floor on the larger models would appeal to some. The lack of slides is obviously a major negative. Just wanted to see if anyone had researched going in that direction. Thanks. RandyA, thanks for bringing up the topic of insurance. I never considered that angle. Buying an older unit and putting considerable dollars into a remodel only to find out that you're covered for a fraction of your total outlay if anything happens is a real concern. Has anyone else dealt with this issue specifically when sourcing insurance for an upgraded fiver? A stated value policy would be ideal, but maybe there are alternatives that provide at least marginally more coverage than just book value. We will definitely take you up on that. We are prepared for the stress of a remodel and more determined than ever to find someone with experience to oversee the project with us. Thanks for all the incredible information. Roger, if you are going to be at the ECR, I'd love the opportunity to sit down and pick your brain over a bottle of your favorite poison. I wish DW and I had the skills and training to tackle a project like this ourselves, but we would almost certainly be looking to hire someone with experience to take the lead. I will contact Kansas RV Center about possible options on that front. We likely won't be transitioning to FT until 2019, so lots of time to do more research and find both a good unit and our A-Team to help us make our vision a reality. Keep the ideas flowing and we are looking forward to many informative conversations in TN. We had posted a while back about our desire to find a full-time rig that doesn't have a "country-style" interior. Our tastes lean to clean modernism, but finding something like that from the factory (save the total custom/uber-pricey world of Spacecraft and the like) is a pipe dream. So our thought is buy a quality unit that has a few years on it (+/-10) and remodel it to our style. This would likely include the following: New flooring, window coverings, cabinet doors/pulls, paint/tile/wallpaper walls, replace kitchen countertops/backsplash/appliances and new furniture. Basically, we want to go from this: to something resembling this (be kind, we understand the limitations of RV construction and that you can't spin straw into gold): So with this as the backdrop for the project, what models would make for a good quasi-blank canvas? We have been diligent in our research and understand that it's the things you can't see that make a quality rig. Frame design, insulation, roof construction, dual pane windows and the like matter most as much of the interior will be removed. Ideally, we'd like to find something +/-40' in length and our budget pre-renovation would be around $50K. The common floorplan of rear living and front bedroom work fine for our needs. If any of you out there have tackled anything similar to this, we'd love to hear about your experience. We certainly understand that this comes with much more stress than buying something newer off the lot, but as this will be our new home, we want to love the space as much as possible. Thanks in advance for your feedback. We'll be at the ECR if anyone wants to chat in person. A quick recap that the DW and I are total noobs still looking to purchase our first rig. My better half is a wee thing of 5'1" and is concerned that she will struggle to reach the pedals with her slightly less than runway model-length legs. Even in our normal grocery-getter, her feet barely reach the floorboards. Do Volvo seats (stock or common replacements) offer enough adjustment to accommodate shorter folks? Are the pedals themselves movable? Thanks. My wife and I will be there. Total noobs, but excited nonetheless. We're flying in from Baltimore for the week and staying in a hotel in Hutchinson. Our plan is to full-time in a couple years and we're excited about the tapping into all the expertise and lessons learned from those living the lifestyle.